I have dropped my flash from the lightstand too many times. The locking mechanism on my Nikon SB800 does not seem to really grip onto the cold shoe. It just feels loose. Recently, I found an accessory that can really hold onto the flash, tight. 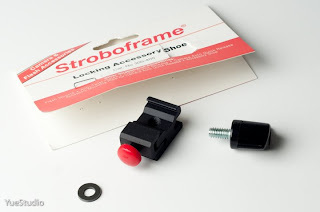 It's called Stroboframe Bracket Shoe Mount. On the package, it says "Locking Accessory Shoe," Cat. No 300-405. It has a 1/4" screw hole that fits the stud of the lightstand. It has a little screw (the red knob in the picture) that adjust the clamp. The clamp really grips the flash tight. This is a great little accessory that everyone should have.